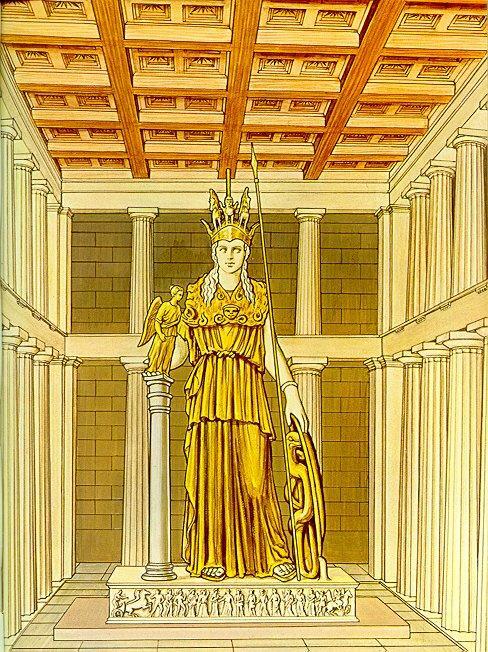 As restored from copies, Athena probably stood with her weight on her right leg, and her left leg relaxed. She wore sandals, a peplos belted over the overfold, an aegis, and a helmet. A centauromachy was illustrated on the soles of her sandals, and the helmet was decorated with griffins and sphinxes. On the palm of her outstretched right hand she held a statue of Nike, and in the other she held a spear. At her feet rested a shield, within which a serpent (representing Erichthonius) was coiled. The shield was decorated on the outside with an Amazonomachy, and on the inside with a Gigantomachy. On the statue base was illustrated the birth of Pandora, the progenitor of the race of women.